Basketball season is in full flight. Within the ACC, tiers start to emerge as every team has played at least four league games. The Duke-Virginia game on Saturday night was a gem, too. So without further adieu, let’s jump in on this week’s ACC Basketball Power Rankings. Even without point guard Tre Jones, Duke rebounded in Saturday’s marquee matchup with No. 4 Virginia — a thrilling 72-70 home victory. Duke squeezed its rotation, using just seven players. Jack White and R.J. Barrett played 40 minutes each; Zion Williamson nearly went the distance, too. This game was all about Barrett and Williamson, who combined for 57 points (21-of-35 FGA), 25 free throw attempts, four assists and only four turnovers. Barrett played the entire game, shouldered more play-making responsibilities and turned the ball over just once against an excellent defense. This was a dominant isolation performance from Williamson, too. Duke assisted on just six of its 26 field goals, which translates to an assist rate of 23.1 percent — a season low. Williamson was a monster, blasting his way through an excellent defensive unit. De’Andre Hunter is a star and looks like the kind of defender Williamson will see a lot more of in the NBA, but he had no chance against the bullying powers of the future No. 1 pick. These two teams rematch on Feb. 9 in Charlottesville. Round Two should be a treat. 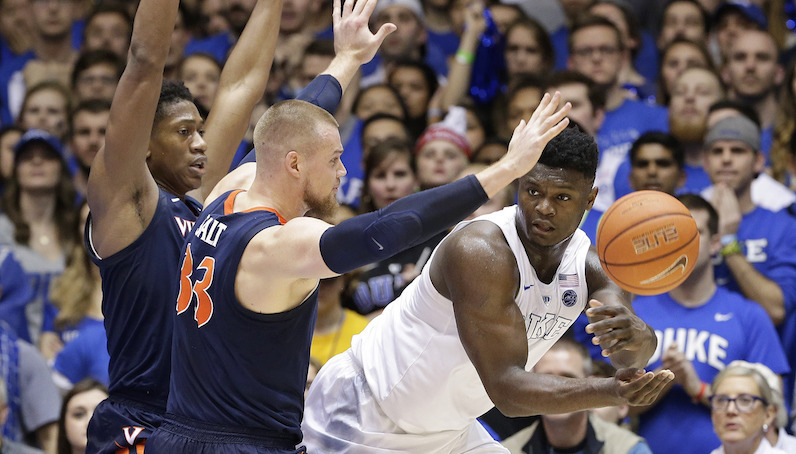 It was obvious from the jump: Duke did something differently on defense against Virginia. In an effort to limit open catch-and-shoot 3-point attempts for Kyle Guy and Ty Jerome — two spot-up aces — Duke elected to switch 1-5. With Jones out of the lineup, everyone that played for Duke on Saturday was between 6-foot-5 and 6-foot-11, which can help unlock some of that position-less approach. Virginia’s whirling mover-blocker offense is the perfect vehicle to create open looks from deep for Guy and Jerome. Defenders must lock in, help perfectly and guard late into the shot clock around an endless supply of pindown and flare screens. Duke simplified that equation, though. By switching 1-5, the Blue Devils cut down on quality looks for UVA. As a team, only 32.1 percent of Virginia’s field goal attempts were of the 3-point variety — the fourth lowest single-game attempt rate this season. Guy and Jerome went a combined 3-of-12 from deep. It felt sort of similar to what happened in the 2018 Western Conference Finals. In that series, the aggressive switching of Houston forced Golden State to ditch its beautiful split action motion offense approach. Instead, the Warriors were forced to play isolation basketball. The strategy almost worked — right up until Chris Paul’s untimely hamstring injury. Virginia has players that can go get their own shots, especially Dre Hunter — a face-up monster. However, it helps tilt the math in Duke’s favor — reducing those 3-pointers. Hunter lit up the mismatch with Marques Bolden a few times; Guy also got all the way to the rim for a finish, too — going right by Cam Reddish and Bolden. On the surface, this wasn’t a bad offensive performance for Virginia: 1.11 points per possession against the nation’s most athletic defense. However, an assist rate of only 28.6 percent shows that Virginia couldn’t get to a lot of its pet sets. Hunter was amazing at times, though. This is just the fourth time since 2010-11 that UVA has posted a sub-30 percent assist rate in a game. Step back Inside the Playbook with me, yeah? Down six points with under 30 seconds to play, Virginia went to one of its go-to half-court sets: elevator doors for Kyle Guy. I broke this play down last season, when Virginia ran it with great success against Press Virginia. Hunter comes off a brush screen from Guy with Braxton Key and Jack Salt spaced to the strong side of the floor. Guy, excellent at moving without the ball, sets Cam Reddish up perfectly, before zipping to his right while Salt and Key slam the doors shut. After switching perfectly for most of the game, Duke doesn’t communicate here, and Guy gets maybe the best look he had all game. After two sluggish offensive performance, Virginia Tech got exactly what the basketball doctors ordered: Wake Forest. The Hokies splashed 11 3-pointers (42.3 3P%) and scored 1.28 points per possession against the Demon Deacons, who now rank outside the top 200 nationally in both defensive efficiency and opponent effective shooting (52.5 eFG%). Nickeil Alexander-Walker did his thing, again: 24 points, 3 3-pointers and six assists. Can he keep it up against the Tar Heels? North Carolina went on the road and took care of business against Miami, the team’s second win of the week. In an impressive offensive performance, Cameron Johnson, Coby White and Luke Maye all posted usage rates of 22+ percent and scored 14+ points. Carolina was +14 with White on the floor and -5 with him on the bench today. Both Woods and Black had rough stints as backup PG. Through 5 ACC games, UNC is +41 with White on the court and -14 with him on the bench. It had the same issue last season when Joel Berry sat. For the second straight game, Nassir Little made his presence felt off the bench, too — 12 points (8 FTA), two steals, one highlight reel block and a slam that should turn a few heads. With Little’s improved impact, it will be interesting to see if North Carolina can get more of the Johnson-Little pairing on the floor. It’s been a boon in ACC play. Also, I loved this half-court set UNC ran late against Miami, which took advantage of Johnson’s gravity as a shooter. Johnson flies off staggered pindowns from Garrison Brooks and Kenny Williams on the weak side of the floor. He curls the second screen from Williams with Sam Waardenburg trailing. Chris Lykes, who is matched with Williams, drops down to curtail the curl of Johnson. This leads to an easy but effective counter for UNC, though; Williams pops above the arc and is now wide open for a catch-and-shoot 3-point rip. One last quick note on UNC: I liked seeing them close the first half with Johnson and Leaky Black as the de facto 4/5 combination. Keep exploring those small-ball options, Roy. Over the weekend, Louisville hit just seven 3-pointers and attempted only 14 free throws; however, the Cardinals still scored 1.08 points per possession in a win over Georgia Tech, thanks to another monster performance from Jordan Nwora. While working against one of the better defenses in the nation, Nwora went for 25 points (on 16 FGA), eight rebounds and two assists. It’s his ninth game with 20+ points this season. Christen Cunningham continues to emerge, too. The grad transfer point guard dished out 11 assists to zero turnovers. Cunningham is just the 30th player this season, and the first from the ACC, to hand out 10+ assists and record zero turnovers. For the season, he’s assisted on 29 percent of his teammates’ field goals while on the floor, per KenPom. No road win in the ACC should be taken lightly, especially without your starting point guard in the lineup. NC State was again without Markell Johnson, who made the trip to Notre Dame but didn’t play for the second straight game. The Pack hung tough, though, and scored 1.1 points per possession. Torin Dorn (13 points, 9 rebounds, 2 assists) took on more of the play-making duties; so, too, did C.J. Bryce, who had one of his best games in an NC State uniform. The UNC Wilmington transfer pumped in 23 points and hit all five of his 3-point attempts. This team won’t win any awards for offense, but that’s fine; Syracuse can win ugly. That was the plan before the season started, and it was enacted to perfection with two wins last week — at Duke (without Tre Jones, for the most part), home to Pitt. The overtime affair in Durham was a wacky game; an injury to Jones shook that game off its axis. However, it’s worth highlighting that in both wins last week, Syracuse hit from deep. After going 11-of-25 (44 3P%) at Duke, Syracuse followed that up by going 12-of-26 (46.2 3P%) against Pitt. In the win over Pitt, Buddy Boeheim hit four 3-pointers and scored a career-high 13 points. This is the kind of production Syracuse needs to compliment its top-15 defense. I maintain that this is a very good Florida State team, but the Seminoles went winless last week — against Pittsburgh and Boston College, both on the road — and are now 1-4 in league play. After weathering time without Phil Cofer, FSU has hit a skid. Is there a chance that we’ve fallen guilty of a famous sports fallacy: overrating a team/player based on when you last saw them play? Perhaps. Remember: FSU closed the 2017-18 season in good form — narrowly missing a trip to the Final Four. I’m not totally buying that theory, however. This team already has a couple notable wins: Florida, Purdue and LSU. Florida State still ranks inside the top 40 in both adjusted offensive and defensive efficiency, per KenPom. There are some really good players on this team, too; the ACC Sports analytics pages still serves as the de facto clubhouse for the Trent Forrest Fan Club. One key issue, though: 3-point shooting. Without Braian Angola, FSU needed range shooting from P.J. Savoy and M.J. Walker. Well, so far, those two are a combined 48-of-154 from deep (31.2 3P%). Florida State ranks 230th nationally in 3-point attempt rate (36.6 percent) and 3-point percentage (31.3 3P%). That has to pick up. The schedule makers did Clemson no favors to start its conference slate. In the span of a week, Clemson had to play at Duke, at Syracuse and then home to Virginia. That’s an absolute bear to handle. Last week, though, the Tigers could regroup. Clemson won its only game — a 72-60 home victory over Georgia Tech. Shelton Mitchell, who has struggled with his shot this season, scored only two points (1-of-5 FGA), but dished out nine assists. As usual, Marcquise Reed led the way on offense with a career-high 30 points. There are few easy games in the ACC, but the next few weeks are a little more forgiving for Clemson, although two road dates with FSU and NC State next week will be a challenge. Yeah, this league is brutal. One of the feel-good stories of the college hoops season, Pitt continues to impress. If not for a power outage early in the second half at Syracuse — six points in the first 10 minutes — we may be talking about a Panthers team with a 3-2 ACC record. Syracuse’s zone gave Pitt issues. Xavier Johnson shot the ball well, but turned it over six times, too; Trey McGowens came back to Earth — seven points on 2-of-13 shooting. The Panthers scored under 0.9 points per possession (42.3 eFG%). This will be a tough week. Jeff Capel heads back to Durham for a reunion game with Duke on Tuesday; then on Saturday, Pitt hosts Louisville. Notre Dame got another monster performance from John Mooney — 19 points, 16 rebounds — but fell at home to NC State. Notre Dame without big man Juwan Durham for the next two weeks with a nagging ankle injury. Freshman Chris Doherty is available to play…would burn his redshirt but Irish may not have much of a choice. Without Juwan Durham and his 22 percent block rate in the lineup, Notre Dame blocked only four shots and allowed the Pack to score 1.1 points per possession. No Durham is a hit for Notre Dame; over the next seven days, the Irish have games with Georgia Tech, Virginia and Duke. Turnovers and 3-point shooting, predictably, continue to be a thorn in this team’s side. Georgia Tech is shooting just 31.1 percent from beyond the arc — No. 297 — and has a gaudy turnover rate of 21.5 percent — No. 303. This Tuesday bring a big matchup with Notre Dame. It’s imperative that the Yellow Jackets hold down the home floor that night. After that matchup, dates with Duke and UNC await. It’s hard not to feel for this Miami team. The Hurricanes are 1-4 in the ACC, but have had second-half leads in many of their games this season. Miami just doesn’t have the depth to sustain for 40 minutes, it seems. The bench accounts for only 22 percent of Miami’s minutes this season, which ranks No. 339 in the nation, according to KenPom. On Saturday, UNC outscored Miami’s seven-man rotation 48-39 in the second half. Quick shout to Chris Lykes and Anthony Lawrence, though, who form a wonderful pick-and-pop battery. If you squint at the screen hard enough, you can see the ACC’s version of Kemba Walker and Marvin Williams with the Charlotte Hornets. Lawrence is a solid second-side player; he’s able to space out and provide balance to a ball-screen centric offense run by Lykes. The senior forward hit three 3-pointers against UNC and is now shooting 37 percent from deep on the season. Boston College hit the brakes on a five-game losing streak and picked up its first ACC win of the season. How’d they do it, you ask? Well, watch Ky Bowman work. Also: In his second game back from injury, Steffon Mitchell was solid — five points, eight rebounds, four assists, three blocks and two steals. One step forward, one step back: Welcome to Wake Forest basketball. The Demon Deacons picked up a really nice home win over NC State. However, that was followed up with a rough showing in Blacksburg, losing by 16 to Virginia Tech. Wake Forest has played 17 games so far this season; in five of those contests, they’ve allowed over 1.2 points per possession.